Rita Lucey has waited 80 long years to become a priest. There was just one tiny hurdle in the way: her gender. Barred by Roman Catholic dogma from joining the priesthood, Lucey did it her own way — and found a sisterhood instead. On Saturday, Jan. 18, Lucey was ordained as a Roman Catholic priest in a ceremony that is not only unrecognized by the Vatican, but also one that makes Lucey susceptible to excommunication. Ordained, then excommunicated in almost the same breath? That's the normal plight of Roman Catholic women priests in the United States. "If that happens, that's how it will be," Lucey told Central Florida's News 13. "But because I am called by the Holy Spirit to be a priest, I am here." The great-grandmother is hardly alone in her unconventional spiritual journey. Lucey was ordained by a female bishop in a ceremony overseen by the Association of Roman Catholic Women Priests, a growing women-led movement that is powering alongside the Catholic Church despite being ignored by the cardinals in Rome. 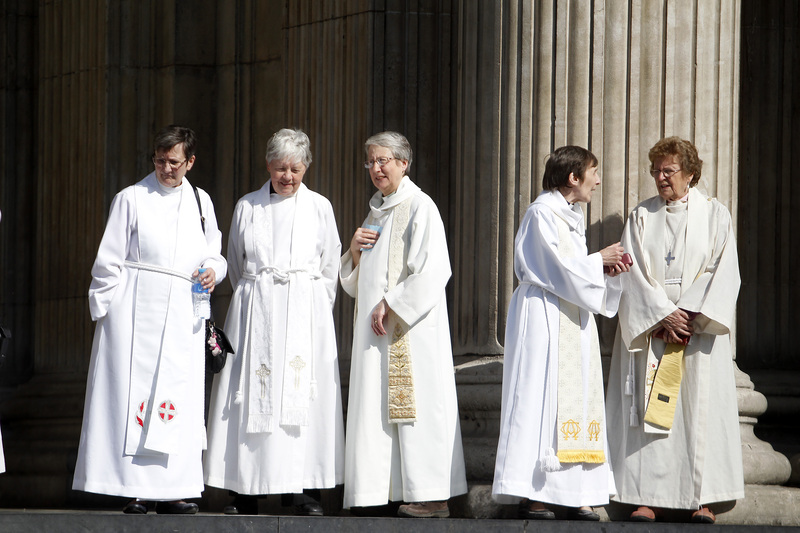 According to the ARCWP, there are more than 124 ordained women priests and 10 women bishops worldwide. All of those participating in the women-centric organization have been excommunicated by the Catholic Church. However, the ARCWP insists that the organization is in "apostolic succession" with the Vatican, because the first female bishop was ordained by a male bishop. "Therefore, our bishops validly ordain deacons, priests and bishops," the ARCWP claims in its statement of apostolic succession.But no matter what the Vatican thinks, feels or threatens, the women priests and bishops still feel they are in communion with the Catholic Church. "We do not accept [excommunication] and affirm that we are loyal members of the church," the ARCWP writes on its website. "We continue to serve our beloved church in a renewed priestly ministry." Lucey, who's not only a woman but (gasp!) married, admitted to NBC News that her act of religious defiance on Saturday was as much a political move as it was a spiritual awakening. "It's such an injustice within the Catholic Church that women are not treated equally," Lucey told NBC News. Although a number of Protestant faiths, including the Episcopal Church, ordain women as priests and bishops, the men who rule the Catholic Church continue to staunchly oppose women's ordination on the basis of canon law. There are several defenses the male hierarchy and conservative Catholics have used to defend the exclusion of women from the priesthood, including the fact that since women cannot be fathers in the biological sense, they cannot lead in the spiritual sense. Pope John Paul II has also routinely fallen back on defined gender roles within the church, reiterating throughout his papacy that Jesus picked only men as his apostles, therefore making the hierarchy "masculine." However, in an age where women have fought for equal rights inside and outside of the Catholic Church, the flimsy defenses seem to be falling on deaf — and defiant — ears. "The Vatican cannot continue to discriminate against women and blame God for it," Bishop Bridget Mary Meehan told NBC News. The introduction of girl servers also led many boys to abandon altar service. Young boys don’t want to do things with girls. It’s just natural. The girls were also very good at altar service. So many boys drifted away over time. I want to emphasize that the practice of having exclusively boys as altar servers has nothing to do with inequality of women in the Church. While Burke's interview, which also criticized radical feminism for purportedly tainting the Catholic Church, was lampooned by Catholic feminists over the last week, his baseless accusations are nothing to laugh about. These views are held by many men within the Catholic Church, and even the ostensibly liberal Pope Francis has repeatedly put a cork in the women's ordination discussion. For Rita Lucey, it took 80 years to become a Roman Catholic woman priest. For her to be recognized by the Catholic Church, it may take another 80 years — or even longer.